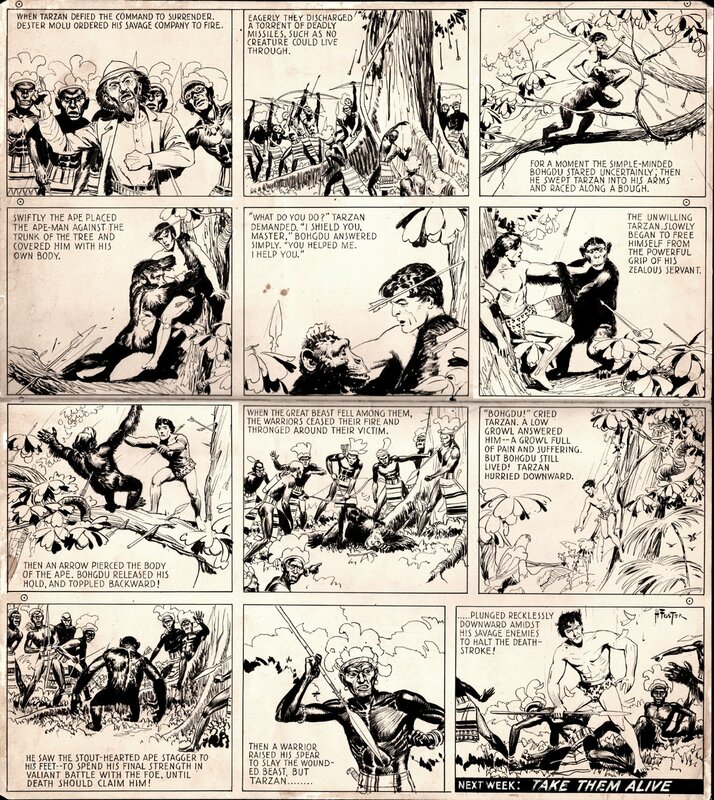 Check out this STUNNING, VINTAGE "prime era" 1935 TARZAN SUNDAY Strip which was penciled and inked by the iconic HAL FOSTER! Just a beautifully drawn Sunday here featuring the 12 great panels from Foster that are all about FAMILY AND FRIENDSHIP! Tarzan and Bohgdu the ape are best friends, so when Tarzan is under attack, Bohgdu covers his friend with his body for protection. The conversation between the two mates (5th panel) is really unique! Tarzan: "what do you do?" Bohgdu: "I shield you, you helped me, I help you". There's more than a comic strip here. It's simply how things should go. Always! The warriors finally wound Bohgdu with arrows, and just before "death claims him" Tarzan leaps from the tree and saves his friend! Important to note that two weeks after this strip...... Bohgdu will meet and kill the evil Dester Molu from this Sunday strip, with his bare hands, having his revenge! This stunning strip is signed by Hal Foster in the last panel. Strip is very large, drawn on 2 large art boards taped together from the back, with a drawn image area measuring 19.75 by 22 inches on larger art board. ALL art on our website can be purchased with VERY fair time payment plan options, and trades are always considered towards this and "ANY" art on our website! Just send us an email to mikeburkey@aol.com and we can try to work something out.